Federal copyright law grants exclusive rights to the use of “original works of authorship,” whether or not they are published. Copyright law protects a broad range of works, including books, poems, songs, paintings and even computer programs. However, copyright law normally does not protect short phrases, such as a company slogan. Trademark law, on the other hand, specifically protects slogans that companies use to identify themselves as the maker of a product. Copyright law protects literary, musical, dramatic, pantomime, choreographic, pictorial, graphic, sculptural, audio, visual and architectural works. This protection occurs automatically upon creation of the work in some tangible format, be it written text, graphic representation, or audio or visual recording. Although the owner is not required to register the copyright with the federal government, a copyright must be registered before it may be fully enforced in court. Copyright protection lasts for 70 years after the author's death. If the right is owned by anyone other than the work's author, copyright protection extends for 95 years from the date of first publication or 120 years from the date of its creation, whichever period is shorter. Specifically excluded from copyright protection are ideas, procedures, processes, systems, methods, concepts, principles or discoveries. Also ineligible for copyright protection are titles, names, pseudonyms, catchwords, catchphrases, mottos, slogans and short advertising expressions. As a rule, company slogans are not copyrightable. Trademark protection is available for slogans that meet the U.S. Patent and Trademark Office's definition of a trademark: “a word, phrase, symbol or design" used to identify and distinguish the source of a product from another. Similar protections extend to service marks, which identify the producer of a service rather than a product. 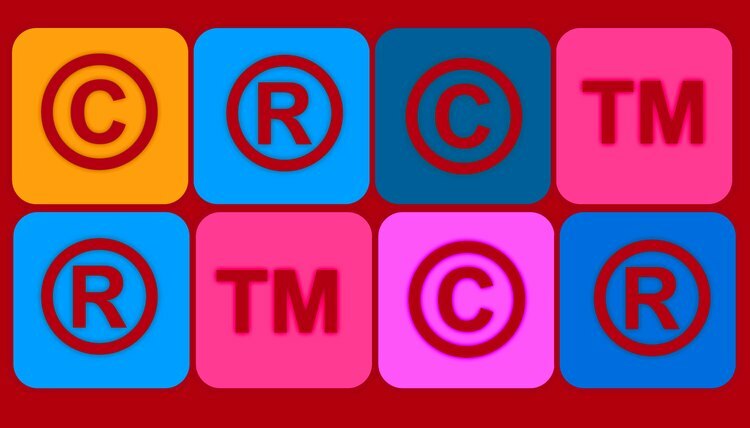 To qualify for trademark protection, a slogan must be distinctive and closely identified with a commercial product or service. Unlike copyrights, which expire after specific time periods, a trademark registration may be extended indefinitely by filing renewal applications. Those who wish to claim rights to a specific mark often follow it with the symbol “TM” to denote ownership or that a formal trademark application has been filed but has not yet been granted. The symbol “®” indicates that an application for trademark protection of the mark has been granted by the U.S. Patent and Trademark Office. Registration of a trademark is an involved process. The application must identify the basis for the trademark filing: either proof the mark is already used in commerce or will be in the near future. The applicant must also search the U.S. Patent and Trademark Office database to confirm the mark has not already been claimed by another applicant. U.S. Patent and Trademark Office: Trademark, Copyright or Patent? Using materials created by other people in a school project isn't necessarily a violation of the copyright laws. Students routinely lift images from web pages to illustrate a science project or quote passages from books in class papers. While the copyright law often protects such materials, the act of copying them may be protected by the fair use exception of the copyright law. Under U.S. law, copyright protection is not dependent upon publication. Authors of literary works have exclusive rights to duplicate, distribute and create derivatives of their works from the moment the work is first preserved in some tangible form. These rights extend for the length of the copyright, regardless of whether the work is ever published. The publisher may choose to cease publication of a book after a few years, but that book remains equally protected by copyright. With the free accessibility of information and creative content over the Internet, it can be hard to know what is legally available to take and enjoy for free. It can be confusing to realize that something that may be free and legal to enjoy in one context may not be in another context. Most people think of commercials as a free bit of advertising that they are subjected to when they watch television or listen to the radio. Just because a commercial is broadcast for free through certain media does not mean that it is legal for anybody to upload the commercial on YouTube or post it for download on a website. Commercials are copyrighted, and only authorized parties may broadcast, copy or distribute them. Can Students Draw a Cartoon Character or Is It Copyrighted? Do You Have to Trademark Paintings? Who Owns the Copyright on Wedding Pictures?